The Greenline Composter consists of a robust beater house, where branches, leaves, brush cuttings, wreaths, and much more can be broken down by means of strong, angled beaters and cutter bars. 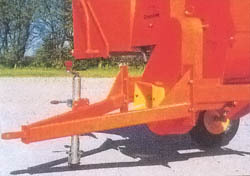 The material is a fed and held by a hydraulic feed roller whilst its broken down. 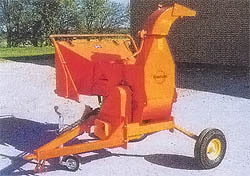 The standard model Composter is constructed for 3 point linkage, but is also available as trailermounted, and can be operated by tractors from right down to 13 Kw. The material does not have to be moved to somewhere else- it can be used as wood-chips right where the branches are cut off, thereby saving both time and money. Alternatively, the Composter breaks down the material, and gives the bacteria the best chance of decomposting the branches.